Interested in contributing to allrightnow.com? If youd like to get involved, then drop me a line at piller@fan.net detailing what youd like to do and a bit about yourself. The band needs a new vocalist. were formed to reflect this rich musical heritage left by their namesake. With high levels of attention to the musical detail of Bad Company, Baad Company are able to recreate this music loved by millions in all its glory - music that rocked the world across two decades. Chuck and Paul Rodgers of Free,Bad Company and Queen April 2000. 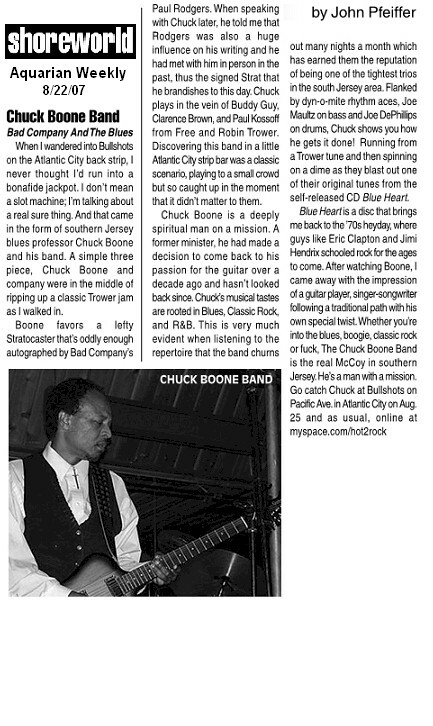 Paul Rodgers autographs Chuck's Strat in Atlantic City 2002. 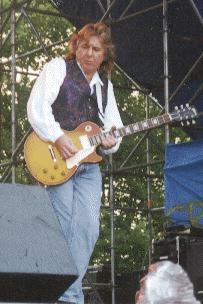 On 25 August 2007, The Diamond in Mansfield UK will present X-COM, featuring Mick Ralphs, Dave 'Bucket' Colwell, Robert Hart, and Jaz Lochrie. The show is billed as An Evening of Original Bad Company Music from X COM, plus special guest Mr. Harry James (drummer from Thunder). See the venue website for more information. Bad Company guitarist, Dave 'Bucket' Colwell, is nearing completion on the Bucket & Co. album titled Guitars, Beers & Tears. The album features many of Bucket's friends and rock legends such as Adrian Smith (Iron Maiden), Spike (The Quireboys), Edwin McCain, Steve Conte (New York Dolls), Mark Read (A1, The Jones Gang), Jaz Lochrie (Bad Company), Harry James (Thunder) among others. "This project has been a labor of love and I am really pleased with the results up to this point" said Bucket. "By recording my own music I have broken into a new level of creativity." The album is also being produced by Dave 'Bucket' Colwell and being mixed by renowned sound engineer Kevin VanBerger. Look for the album to hit store shelves in the near future. Bad Company members Mick Ralphs, Dave ' Bucket'Colwell, Robert Hart and Jaz Lochrie. The band also features special guest Harry James from the band Thunder. This event will be an experience not to be missed. To think Peter Green grew up in the same town as me Bethnal Green - Still blows me away ! Desolation Angels was formed to recreate exactly the aura and excitement of this beloved super group in action. 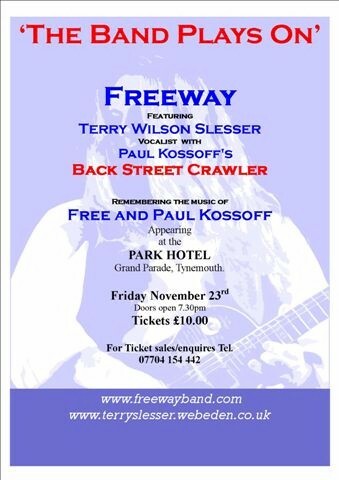 Filling the role of singer Paul Rodgers (who was known as the "the Voice" since his days in Free) is the multi-talented Mark McPhail. Mark not only sings and plays like his Bad Co. counterpart, but bears an uncanny likeness to him as well. From his high-energy stage presence, to his incredible rapport with audiences, youll swear youre seeing the real thing. The Ultimate Tribute to Bad Company. Live in Atlanta the amazing Barry Richman !! Preview from the soon to be released ANDY FRASER/ALIVE.